The opening ceremony of the Training Course for Promoting Stable Employment of Foreign Residents in FY2016, Shinjuku course was held. 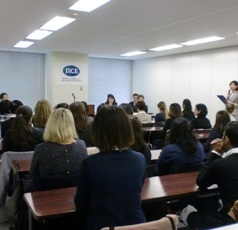 The opening ceremony for the Shinjuku Course of the FY2016 Training Course for Promoting Stable Employment of foreign Residents was held at the JICE Headquarters. 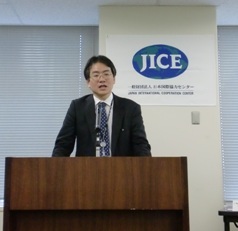 The ceremony was attended by Mr. Shunji KUCHIRA, Director of Foreign Workers’ Affairs Division, Employment Measures for the Dispatched and Fixed-term Workers Department, Employment Security Bureau of the Ministry of Health, Labour and Welfare　（MHLW）, and the officers from Tokyo Labor Bureau and Shinjuku Public Employment Security Office (Hello Work Shinjuku). 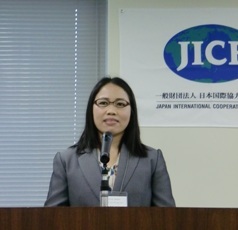 On behalf of the participants, Ms. Marilou YAMAGUCHI from the Philippines expressed her determination to acquire Japanese which is used in the care field and to obtain the qualification as a care worker, hoping that she will work as a full time employee in the future. 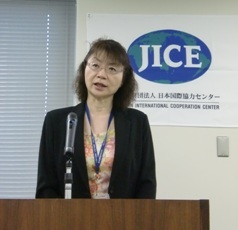 Ms. Masako KISHIMOTO, Vice President of JICE, encouraged participants to get stable jobs by learning Japanese communication skills useful at the workplace and increasing the understanding of Japanese working environment through this training course. In FY2016, 260 training courses are scheduled to be held in 89 cities of 16 prefectures nationwide. JICE will further implement this project, aiming to realize stable employment for more foreign residents.